With marketing teams in several cities - Atlanta, Tampa and Gainesville, FL - 352 Inc. provides your business with the team you need to drive change through early stage innovation, digital transformation, product development and ROI-driven digital marketing. 352 Inc. was actively looking for tools to help scale its data analysis and reduce the amount of time needed generating monthly reports for its clients. Currently experiencing a surge in new clients, they knew it would be nearly impossible to manage the reports and the reporting cycle without a tool to streamline its reporting framework. Its marketing department needed a reporting platform that could scale with its explosive growth, while improving overall efficiency of reporting, so its marketing strategists could focus more fully on tactical execution. 352 Inc. is data driven and rapidly shifts client strategies based on its reporting. Their weekly reports are a keystone to a healthy and transparent relationship with their clients. 352 Inc. was in search of a platform to help manage its reporting cycle. Its teams had recently begun hitting the 200,000-cell maximum in Excel sheets, and reports had become burdensome for both strategists and clients. The current reporting solution was stressed, prompting a decision to review reporting best practices and implement a solution that met high-quality criteria. 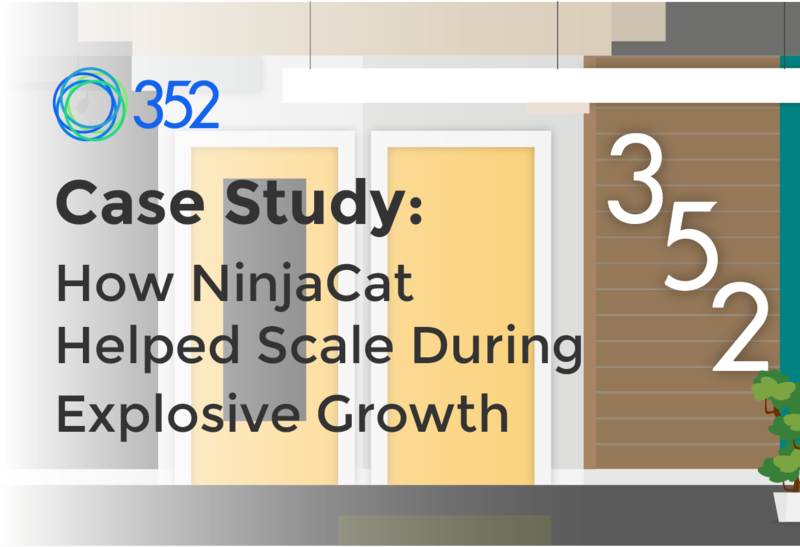 352 Inc. looked to NinjaCat to help them scale effectively and efficiently while still delivering the high-quality reports their clients were accustomed to receiving. Before NinjaCat, teams were running expansive reports manually with Excel and Google Sheets. It was a draining process that forced them into time-consuming administration, rather than executing strategic tasks. Time from tasks that contributed real value to clients. Every hour devoted to manual reporting was an hour that could be better spent improving their clients’ bottom-line. The current reporting solution was having a direct, negative impact on their strategists’ happiness and the effectiveness of their monthly campaigns. 352 Inc. signed on with NinjaCat to take the reins of the reporting cycle. 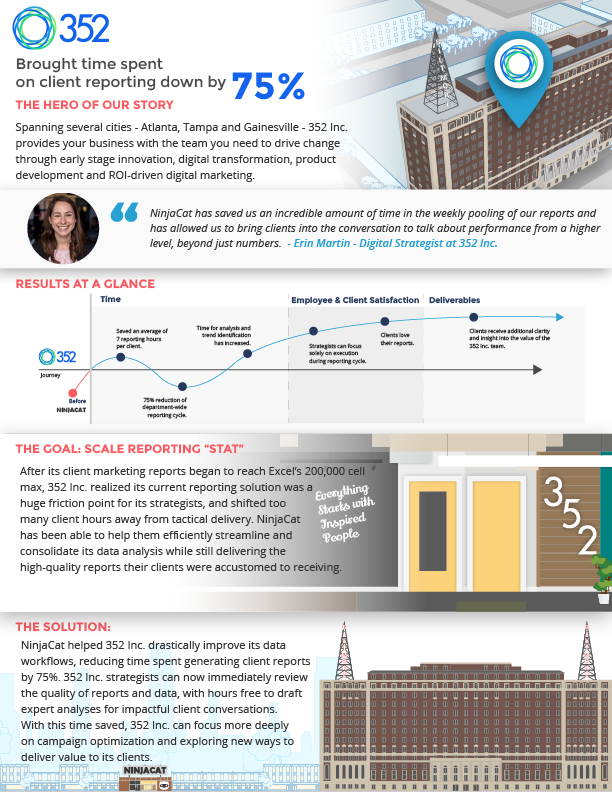 After a quick on-boarding process consisting of hands-on sessions with the client success team, 352 Inc. was ready to bring in data connections and say goodbye to long, arduous reporting cycles. Hello 20 min reports! NinjaCat helped 352 Inc. drastically improve its data workflows, reducing time spent generating client reports by 75%. 352 Inc. strategists can now immediately review the quality of reports and data, with hours free to draft expert analyses for impactful client conversations. With this time saved, 352 Inc. can focus more deeply on campaign optimization and exploring new ways to deliver value to its clients. Not only have clients demonstrated a much deeper understanding of campaign impact, they are providing great feedback and are more engaged in the process! Want to know if NinjaCat can do this for your agency? Maybe you too are experiencing aggressive growth, or maybe you’re seeking aggressive growth? Let’s do a quick demo and proof of concept together. Sign up for a demo today, and allow us to show you the full potential of NinjaCat, the all-in-one reporting and client management solution for digital marketing agencies worldwide!